I’ll be the first to admit that my street cred when it comes to Phish is pretty light. After all, its been almost fifteen years since I’ve actually even seen the band live. That night in the Fall of 1999 at Nassau Coliseum was a fairly famous Phish event, when lyricist Tom Marshall took the stage to sing a few covers with the band. I was also at a Madison Square Garden show during New Year’s week in 1998 when the band played a mini acoustic set in the middle of the show. But 90s memories aside, I do still have some very good friends with close connections to the band — close enough to give us the first-report exclusive of the Phish reunion way back in August of 2008, for which we took a lot of flak but which ultimately proved to be correct. So when it was announced that Phish would play three local GA shows at Randall’s Island I figured it was about time I got out and saw them again and brought to the site a recording that many of our readers have asked about over the years. The trek to Randall’s started out a little rocky — a long line and long-ish wait for the Ferry. But once on the boat the day went about as smooth as could be expected. At the GA shows, there is no “tapers’ section” to speak of, so when I arrived as the second taper to reach the spot we pretty much set up where we landed — about 30 feet in front of the board and pretty close to the ideal spot. Phish fans take a lot of criticism but in reality people were extremely nice to us and also respectful of the rigs. We weren’t able to raise the mic pole as high as I would have liked because we were instructed not to block the band’s cameras, but even with a “low” pole, there is surprisingly little chatter on this recording. My knowledge of Phish is not sufficient for me to say whether this was a “great” show but I’m pretty sure it was a very good one. Perhaps motivated by the release of their new album Fuego, by all accounts of the current tour the band is playing very well right now. And while Friday’s show did feature songs from the new album (we are streaming the excellent performance of “Fuego”), the show itself didn’t dwell on the new material with only three played. Overall the band played a nice selection of songs highlighted by first set standouts “Bathtub Gin” (also streaming) and “Stash”, and second set stalwarts “Down With Disease” and “David Bowie” and a rare-ish cover of local band TV on the Radio (“Golden Age”). I can’t say this show will make me drop everything and follow Phish on tour, but I certainly won’t wait another 15 years to see them again. I recorded this show with the large diaphragm Neumann mics from the front of board spot referenced above. These mics perform well outdoors and this show was no exception. There are two bumps from balloons, but with the excellent location, good crowd and no weather-related issues, this recording came out superbly. Enjoy! acidjack and hi and lo will be recording the Saturday night Phish show for posting on the site on Sunday or Monday. 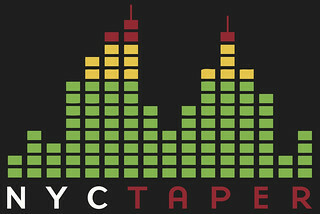 If you download this recording from NYCTaper, we expect that you will PLEASE SUPPORT Phish, visit their website, and purchase Fuego from the Phish Dry Goods [HERE]. INCREDIBLE Neumanns pull from this night. arguably the best of the first 9 shows of this tour – and ive heard em all. Well done! Thank you. Thanks for the kind words about this recording.